*AFTER HOURS DROP OFFS AND PICK UPS MUST BE PREARRANGED AT CHECK-IN!!! NO EXCEPTIONS!!!! 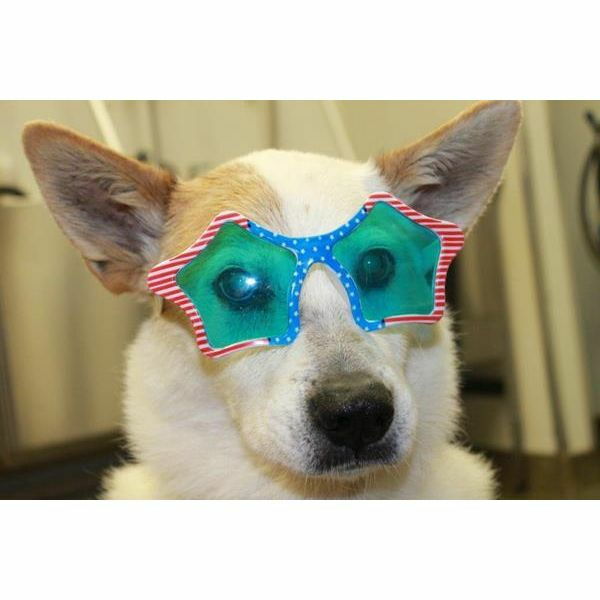 Our lodging facility offers a home away from home - ultimate comfy suites for dogs in a climate -controlled environment. Our Studio Suites are 4.5 x 3, Master Suites are 3.5 x 10, and Twin Suites are 3.5 x 10/4.5 x 3. All of these suites include three potty breaks per day & comfy bedding. We also have six 7 x 10 Luxury Suites. These suites include three potty breaks and two additional playtimes per day. They also feature a TV showing Animal Planet, a pet-web cam, and a super-comfy cot or blanket, whichever you prefer, for nighttime sleeping and daytime napping. Pets are fed a dry, canned or mixed diet food. You are welcome to provide your own food, if you would prefer. If you bring your own food or treats, we ask that you place them in an airtight plastic container. All pets' vaccinations must be current to schedule a lodging appointment. Vaccines required are Rabies, DHPP, Bordetella and, as of March 1, 2019, Canine Influenza (Bivalent). 7am Up and at'em!!! Lodging & Daycare dogs will be here soon, ready to stay & play. Animal Planet is turned on. 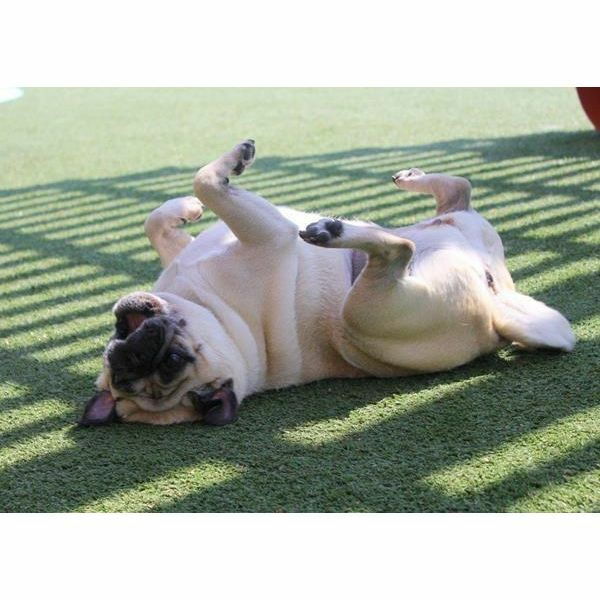 7am - 12pm Potty breaks, breakfast & fresh water is served, grooming and open play times begin. (Depends on weather and how long your pet wants to play up to 15 minutes.) Lots of romping, sniffing, and lounging! 12pm - 2pm Potty break, lunch and a well-deserved nap. 6pm Bedtime treat and lights out! Gotta rest up for another busy play day tomorrow! PLAYTIMES May vary day-to-day and on weekends. Pets will receive all scheduled activities. These all depend on the weather and how long your pet wants to play, up to 15 minutes. 7am Up and at'em!!! Lodging & Daycare dogs will be here soon, ready to stay and play. 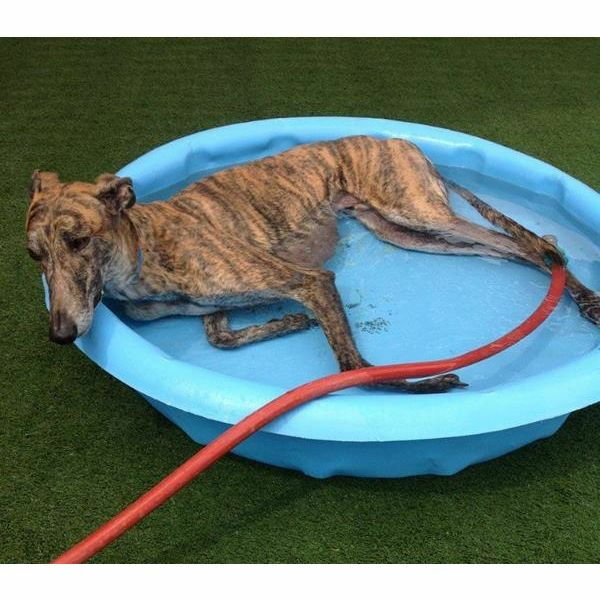 7am - 12pm Potty breaks, breakfast & fresh water is served, grooming and open play times begin. (Depends on weather and how long your pet wants to play up to 15 minutes. Included in Luxury suite lodging and offered for an additional $5 to any other suites.) Lots of romping, sniffing, and lounging! 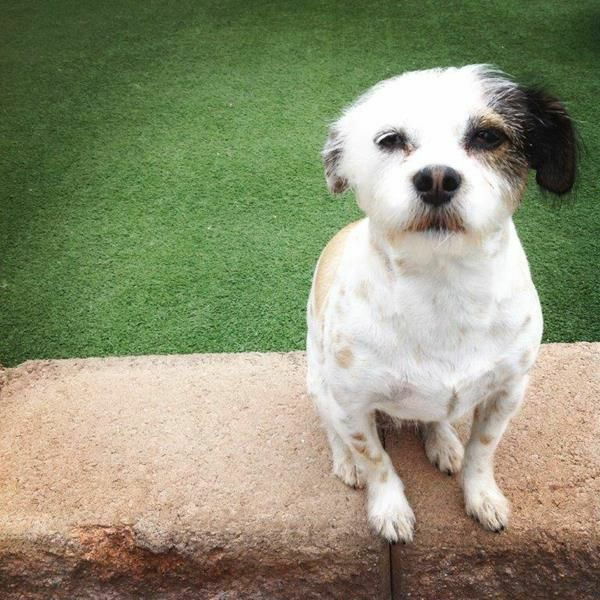 Our Guest Services Technicians & Kennel Assistants will give every pet attention and compassion throughout the day! 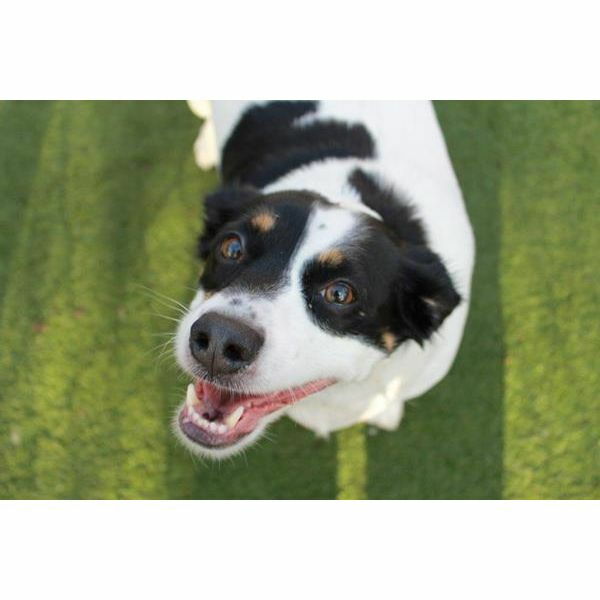 Looking for a fun place to leave your furry kid to play and stay while you’re away at work? We have just the place. During your pet’s stay, they will enjoy lots of tail-wagging fun, attention and social time. We offer group play-times with lots of fun activities. 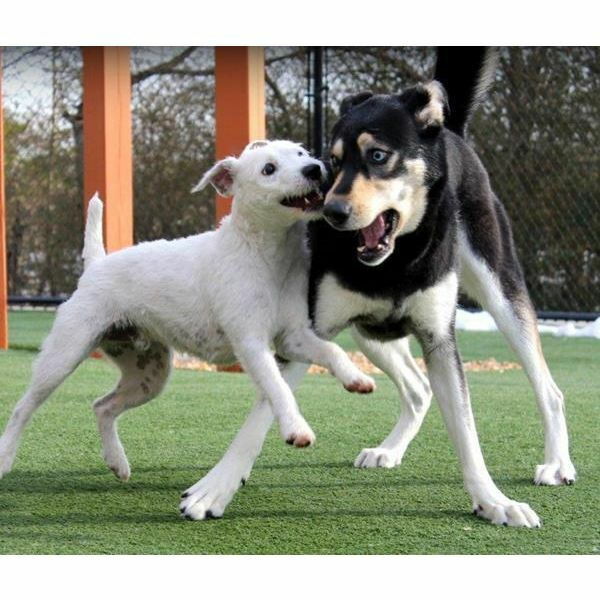 In order for your furry kid to enjoy the playtime, parents will need to sign a waiver form and all pets will have to pass our temperament test. Let your pet enjoy the day with friends while you’re away at work. 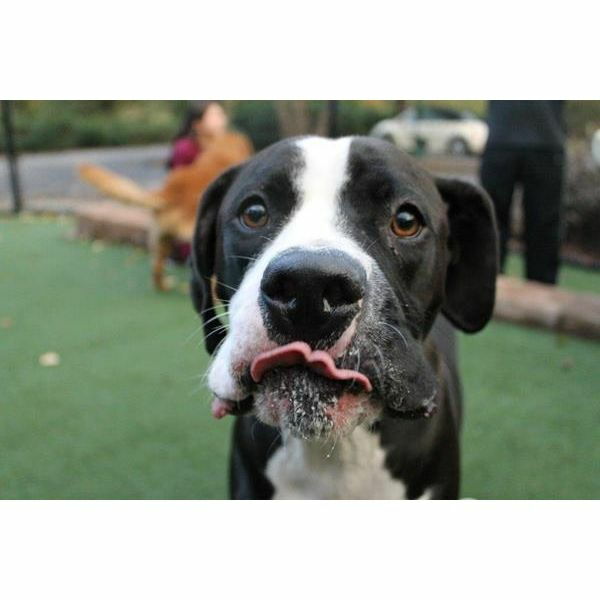 All pets' vaccinations must be current to schedule a daycare visit. 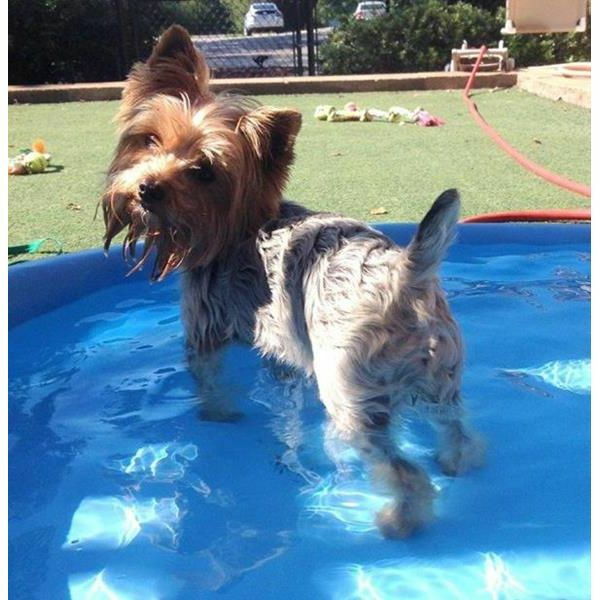 Playtimes are included with our Daycare pets and for pets staying in a Luxury Suite. Pets that are staying in other suites, their “parents” can select the playtime option during their stay ($5 for 15-minute play session). Playtimes are not available for pets staying in "other suites" on Saturdays and Sundays due to limited staff. All playtimes depend on weather and how long your pet wants to play, up to 15 minutes. 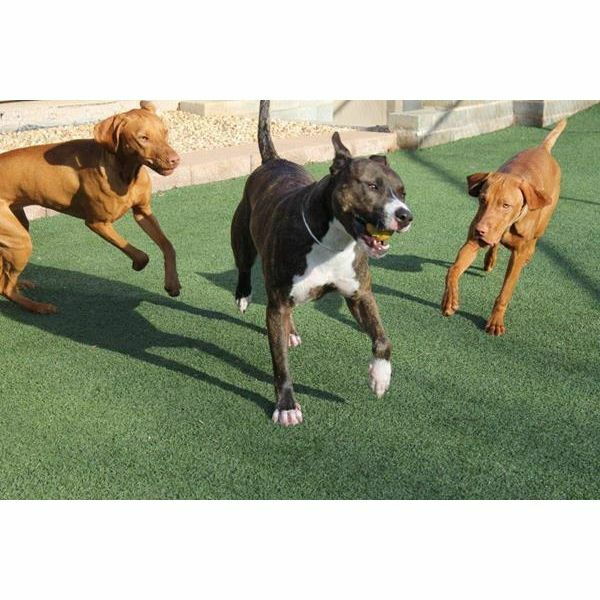 Our play yard provides a great, safe place for your dog to explore. 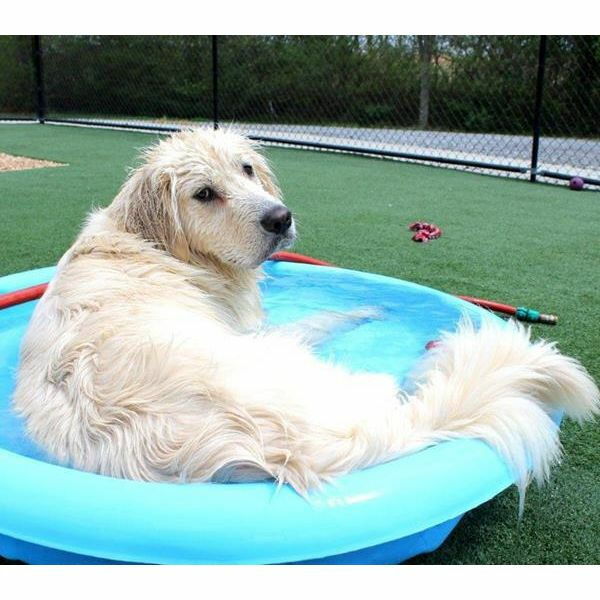 Filled with toys, a kiddie pool and a shady area, your pet will never be bored. Add to that a Kennel Tech to play with, and you’re all set! 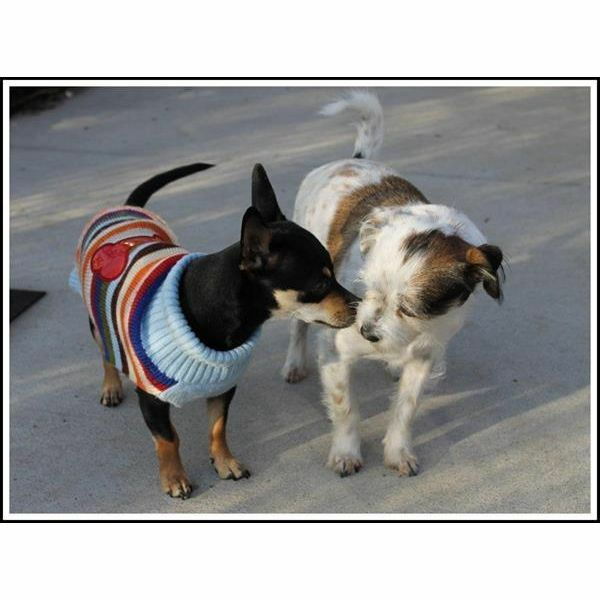 Your pet will be evaluated, and if the requirements are met, your pet may also be introduced to other dogs. Introductions are initiated on a leash. 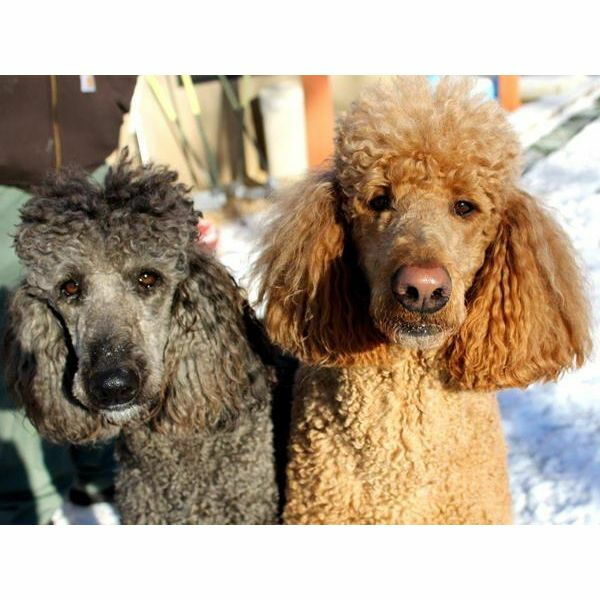 Our technicians monitor your dog’s behavior around the other dogs, and watch for any body language that may be a concern. 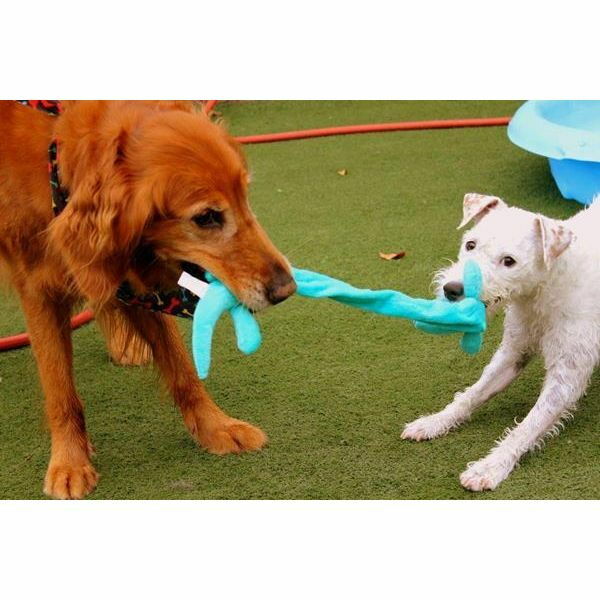 Once your dog has had time to fully adjust to his new friend, both leashes are removed and play time is full speed ahead! Our Kennel Technicians will continue to do these slow introductions for all his new furry friends that are approved for group play-times. 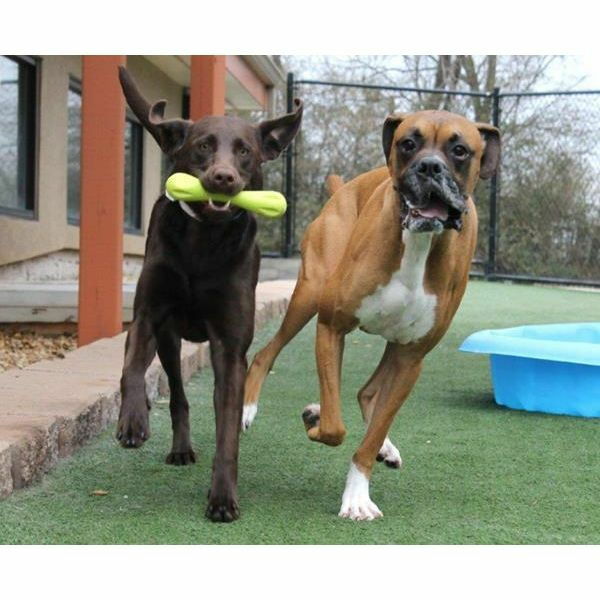 All owners are required to sign a group playtime waiver/release form, prior to joining group playtime. 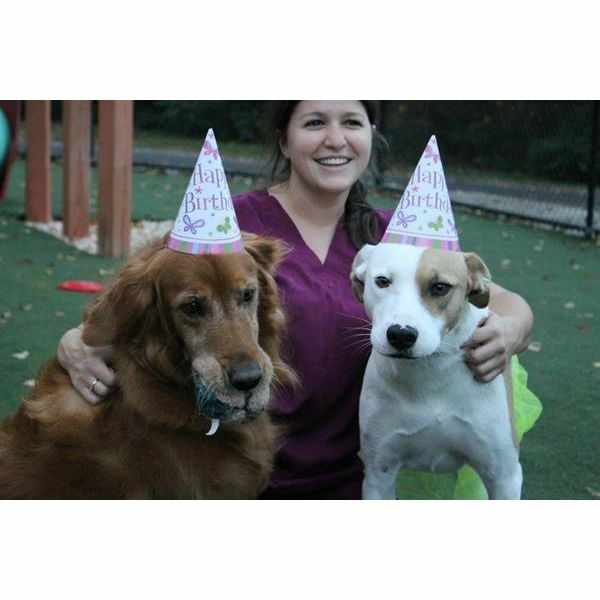 Some dogs may not want to participate in a group playtime – they may want their Kennel Technician all to themselves! 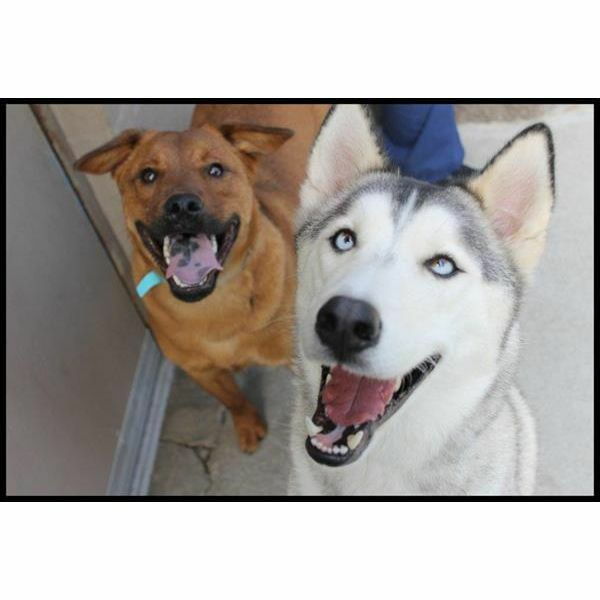 These pets will explore the play area one-on-one with their personal Kennel Technician. Play-times may include brush outs, or some special attention inside if it’s too hot or too cold outside, or in inclement weather. Some pets also appreciate a hand-walk in our real grass area – whatever it takes to make your pet feel comfortable! The play area is not only for playtimes. We also use this area for your pet’s potty breaks during their stay. 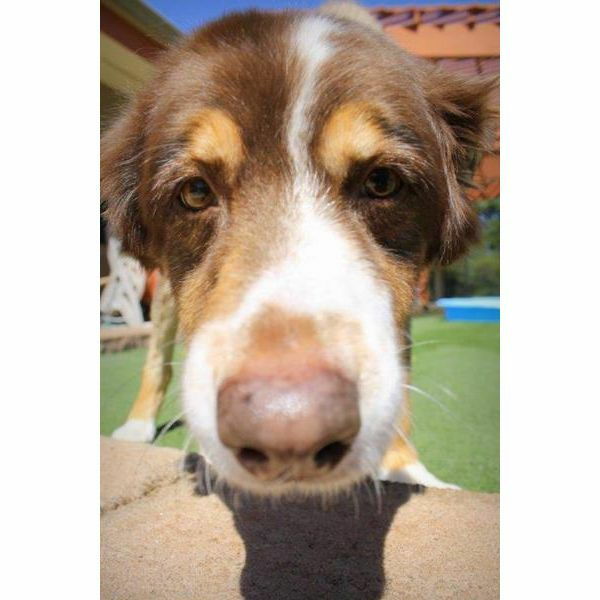 This way, we can monitor your pet’s potty habits, making sure they do their “business” before coming back inside. This area is constantly monitored for cleanliness and scooped regularly. 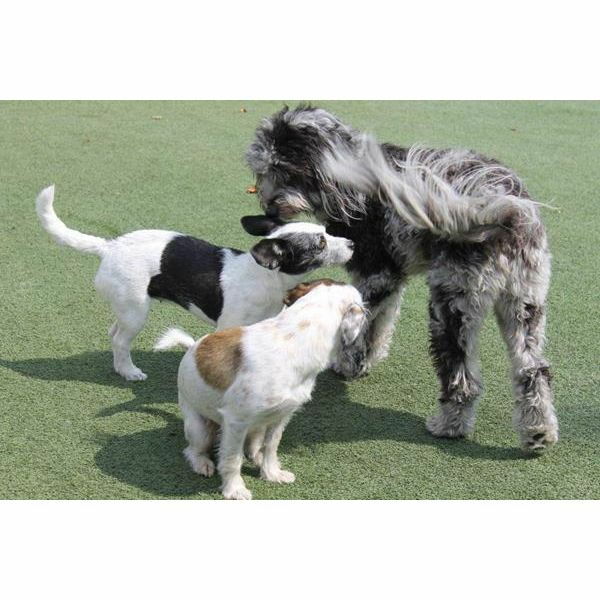 If we see a pet does not like our play area for potty breaks, a Kennel Technician may decide to walk them in our real-grass area – because some dogs just don’t LIKE the fake stuff! Any concerns about your pet will be brought to the attention of one of our doctors immediately. Our cat condos are located in a spacious, private, and quiet room away from the hustle and bustle of the dog boarding area. There is a window in the cat boarding room so your cat can look out onto our landscaped area to bird watch while they are boarding. Each condo has a single space which has an area for the litter box and a ledge so your cat can perch. We also furnish the cat boarding areas with a comfy blanket. These are also large enough to house more than one cat, should you prefer to keep your “furry cat family” together. We feed regulated diets, or we will gladly use the food you provide. We are not able to board intact male cats. All pets' vaccinations must be current to schedule a lodging appointment.